Bots at the Gate: Front Cover. Credit: Design and illustration Jenny Kim. (page 62) Technology travels. Whether in the private or public sector, a country’s decision to implement particular technologies can set an example for other countries to follow. This is doubly true if Canada continues to present itself as a leader both in AI as well as in human rights. Machine learning and predictive analytics in the immigration space is already being explored in various jurisdictions across the world, as well as by international agencies that manage migration, such as the UN. Canada has a unique opportunity to develop international standards that regulate the use of these technologies in accordance with domestic and international human rights obligations. It is particularly important to set a clear example for countries with more problematic human rights records and weaker rule of law, as insufficient ethical standards and weak accounting for human rights impacts can create a slippery slope internationally. Canada may also be responsible for managing the export of these technologies to countries more willing to experiment on noncitizens, and infringe the rights of vulnerable groups with few ramifications. These power dynamics are crucial to interrogate in the migration space, where private sector interventions increasingly proliferate, as seen in the recent growth of countless apps for and about refugees. However, in the push to make people on the move knowable, intelligible, and trackable, technologies that predict refugee flows can entrench xenophobia, as well as encourage discriminatory practices, deprivations of liberty, and denial of due process and procedural safeguards. With the increasing use of technologies to augment or replace immigration decisions, who benefits from these technologies and what does success look like? While efficiency may be valuable, those responsible for human lives should not pursue efficiency at the expense of fairness—fundamental human rights must hold a central place in this discussion. 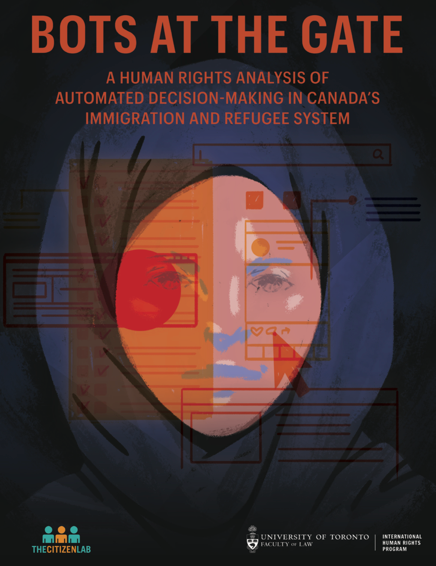 By placing human rights at the centre, the careful and critical use of these new technologies in immigration and refugee decisions can benefit both Canada’s immigration system as well as the people applying to make their new home here.